This blog is written by both Kim (who was observed) and Rachel (who observed Kim) in an AP Language class. Students have just read The Adventures of Huckleberry Finn and supporting nonfiction written/visual texts and are practicing rhetorical analysis focusing on audience and purpose. The focus of this specific lesson was for students to demonstrate understanding of how to use strategies to convince an audience of a clear purpose. Students were to write a letter to a designated audience from a designated perspective regarding whether or not The Adventures of Huckleberry Finn should be banned from schools. To begin, students selected a partner. One partner was asked to raise a finger of 1 or 2. This randomly determined which purpose they were arguing for in their paper: 1) ban the book or 2) do not ban the book. Then students raised another number of 1, 2, or 3 fingers. They then found out their audience based on 1) those who want the book banned, 2) those who are against banning the book or 3) those who are indifferent. Students worked in pairs to brainstorm what strategies would best convince their audience of their purpose (for example, emotion, logic, specific examples, metaphors, etc.). They then wrote a letter to their assigned audience. Finally, the students anonymously swapped letters and provided clear feedback on what strategies they saw the authors using and what worked/didn't work from their assigned perspective. Students will then use this to reflect upon their own rhetorical analysis essays in class tomorrow as they work to revise. 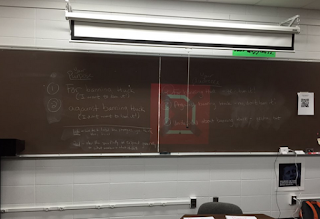 Rachel's Reflection: As a math teacher, I am always amazed at how teachers bring controversial issues to light without creating arguments in class. I am both intimidated by and excited at the thought of having discussions with students on topics of race, gender inequality, sexuality, etc. due to the various perspectives and knowledge of students. Also, people may be ill-informed or not informed enough on some topics, which could potentially lead to building warped opinions. Through this observation, I learned how Kim is using the controversial issue of book banning to open students' eyes to multiple sides of an argument. This activity taught students the importance of gaining pertinent information to support their claim. Since students were not able to choose their side, some may have even written from a perspective different from their own, which I think is a significantly valuable lesson. Because of this activity, her class will eventually be able to discuss social issues that are more pertinent to today and her students in an objective manner. This was truly eye-opening. I would've loved to have been in this class in high school! Subscribe to The Collab Blog! Why Am I Giving a Multiple Choice Quiz? Why Do I Use Twitter? Embed a Video within a Video!